Welcome to Bishop’s Commons, Oswego’s top Enriched Living senior residence. Here, residents find a warm sense of community and take comfort in our Enriched Living services, a special blend of senior housing, support services, and personal assistance. Our affordable apartments have all the comforts of home without the hassles and our highly trained assistance staff is available 24/7. On a scenic hillside overlooking the picturesque Oswego River, canal, and falls, our Enriched Living residences are minutes from downtown Oswego, making it convenient for seniors to visit friends, family, local businesses, and area attractions. Bishop's Commons is a part of The St. Luke Family of Caring, a proud affiliation of community-based, not-for-profit healthcare providers serving the greater-Oswego County area, including St. Luke Health Services and St. Francis Commons Assisted Living Residence. 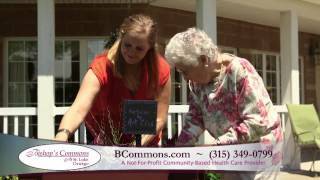 Together we provide residential communities, care, and services to over 300 senior residents daily.